I am not an academic, but I feel as though I long ago reached the point of having tenure as a Naval Officer. Generally speaking, tenure is the right to hold a position for as long as you want to have it after meeting a longevity and performance standard requirement. As a military officer, once someone is promoted to the rank of E-6 or O-4 they are all but guaranteed the opportunity to serve until the 20 year point and thereby earn a retirement barring any conduct shortfalls. In my opinion, that meets the definition of tenure (less the “as long as you want” caveat). The concept of tenure was created in academia as a means of preventing the arbitrary dismissal of faculty members for holding unpopular views, and by all accounts it certainly has protected more than a few who continue to do that. Some will argue that the unintended consequences of tenure is that it has become a shelter for the incompetent and lazy, while also stifling new energy and thinking among faculty members. I certainly have seen evidence supporting both sides of that argument, but choose to believe there is more goodness that comes from the model than anything else. In essence, many tenured professionals use their “employment safety” to lead more boldly, explore more diverse thinking, and stretch minds in ways they haven’t before. The military is largely about conformity. We recruit young men and women who represent the power of our diverse nation – geographical diversity, educational diversity, experiential diversity, and physical diversity, as well as any other way you might choose to measure it. We then take those men and women through a common indoctrination process to help them understand and conduct themselves in keeping with our standards and norms, a very powerful process that is critical to building effective teams. Once properly indoctrinated, we get them a common set of training and experiences over the course of their career to help them realize their potential within their area of specialization. It’s a tried and true process that unintentionally makes us a little less diverse in our thinking with every tour of duty. I say unintentionally because we don’t deliberately seek that as an end-state, but we don’t necessarily do our part to prevent it from happening. By the time we reach that point in our career where we are considered for tenure (roughly nine years of commissioned service), those of us who have the body of work that deems us among the best of the fully qualified are granted exactly that. The question becomes, do we become among the lazy and complacent or do we conduct ourselves in keeping with the intent of tenure? Having tenure is about feeling safe within our team, being a valued stakeholder in the team to which we are a part, and knowing we have both the freedom and the responsibility to constructively dissent when necessary. Many civilians might experience a probation period in their employment where they can be terminated with relative ease as the employer more fully evaluates their commitment, competence, and character. Whether civilian or military, an academic or not, tenure is real and in many instances, necessary. The path to tenure is as varied in length and circumstance, as are the responses of individuals once such a milestone is reached, real or perceived. Upon achieving tenure, some individuals are even more committed to the team and its future, some feel a sense of relief, others get complacent and throttle back a little, and some become fixated on protecting their level of perceived power by ensuring the status quo remains the standard. Tenure should not be the objective, but the feeling that accompanies tenure should. We shouldn’t feel as though we will be fired on a whim with no justification, we shouldn’t feel the need to be something we are not just to appease others while we are not tenured (“Fake it till you make it” is one of the worst and most unfair strategies I know), and we most certainly shouldn’t keep our ideas for improvement to ourselves because we don’t want to rock the boat. We need to be ourselves – that is the reason we were asked to join the team. And if our authentic self is no longer compatible with the team, we ought to acknowledge that either we are holding the team back or the team is holding us back, as we take our passion and abilities elsewhere. It is the responsibility of the leadership team to shape the path to tenure. The better the leadership team, the more quickly others will begin to enjoy the benefit of the tenured mindset. The better the leadership team, the higher the level of commitment is across the entire team. And the higher the percentage of committed teammates, the more likely the future will be far brighter than today. Tenure is not about complacency, it is about trust, competence, and shared vision. I enjoy tenured relationships with many, yet I am in constant pursuit of building a Tenured Team. A team who cares more about the future than the past. A team that thinks horizontally first, and then vertically. A team that truly believes in the law of abundance and shuns the scarcity mindset. Building such a team remains our quest, and looking for teammates with whom to partner remains our constant. 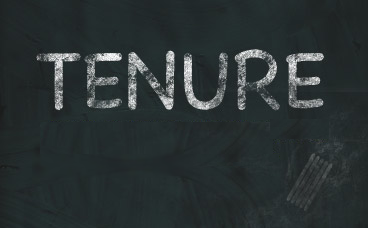 How do you view the concept of tenure? Do you feel tenured within your organization? Are you giving teammates reason to feel a part of a Tenured Team?